During last month's ConcreteWorks event in Indianapolis, Theron Tobolski with NRMCA Producer member Prairie Materials in Bridgeview, IL, shared his "boots on the ground" experience in bringing Roller Compacted Concrete (RCC) to a region of the country that historically was not familiar the product or its installation. "His unique insight from a ready mix producer's perspective was a real eye opener for everyone in the audience," reports NRMCA Vice President, National Resources, Jon Hansen. "Theron dispelled many of the myths about RCC, both from a production and construction point of view, and shared how producing the material for contractors from central mix plants could prove to be very profitable for ready mix producers. As a side benefit, many of the ideas Theron presented will work to sell other ready mix products, not just RCC." Tobolski's previous position was as a product manager in Prairie’s ready mix sales division; he was instrumental in converting traditional asphalt markets to RCC, including a number of local and state agencies, Hansen said. In August he was promoted to the position of lands manager for Prairie Aggregates, but will continue to work from the Bridgeview location. To find out more about Tobolski's presentation, tips on promoting RCC and other concrete in your market, contact Jon Hansen at jhansen@nrmca.org or your National Resource Director. J.G. MaClellan Concrete Sales Manager Rick Lee recently succeeded in convincing an owner of a local auto repair shop to go with concrete for his parking area, reports NRMCA Senior Director, National Resources, Doug O’Neill. Lee asked the all-important question, "What about your parking lot?" which got the ball rolling for converting this project. He then worked several key aspects of the owners interests, including the fact that he was a site contractor, which gave him an insight of the true costs of both asphalt and concrete. The owner was also very particular about the look of his facility, caring about aesthetics and cleanliness. "What makes this such a great story is the fact that Rick was able to develop a relationship with the owner, learn what was important to him and then offered a solution that made sense to him," O’Neill said. "But he didn’t just leave it there, he then set up a meeting with a contractor, S&S Concrete, that could do the work and together they walked the owner through exactly how they were going to construct the parking lot, leaving nothing to chance. This was a textbook case of how to promote and deliver a concrete parking lot." Car dealerships continue to be a market segment that poses well for concrete parking lots, reports NRMCA Vice President, National Resources, Amy Miller. Gordon Singletary, special products representative with NRMCA Producer member S&W Ready Mix, identified an Audi dealership project to be built in the Wilimington, NC, area. Singletary then teamed NRMCA Contractor member Swederski Contracting to pursue the concrete option. Singletary and Swederski prepared a concrete proposal to which the owner was receptive. The idea of using concrete over asphalt was favorable to the owner and to the architect who was considering some decorative options for the "outdoor showroom area." Although Singletary and Swederski’s proposal for the parking lot was accepted, the general contractor eventually chose another concrete contractor. S&W supplied the concrete for the modern and clean look of the parking lot that complimented the sleek architecture of the building. "The owner even chose LED lighting to boot," Miller said. "National Account owners tell us they believe there is a synergy with LED lighting and concrete paving; that asphalt ‘gobbles up’ the lighting. 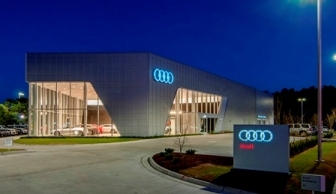 The higher reflectivity and cooler pavements of concrete offers car dealerships (see pic above, courtesy of Frank Hart) an edge in displaying their merchandise as well as additional comfort for the buyer in viewing." The Concrete Sustainability Hub (CSHub) at MIT recently released the research brief Material-Specific Price Projections: Implementation. The brief illustrates how developing probabilistic price projections that outperform current practice and account for the volatility in paving price results in a more accurate life-cycle cost analysis (LCCA). The price projections developed by the CSHub can be implemented either by integrating the forecasting models into a probabilistic LCCA software tool such as FHWA's RealCost or utilizing the price projection tables provided at the end of this brief. The three-step process estimated costs and years of rehabilitation, selected index values from a table for years of rehabilitation and calculated future costs, and calculated adjusted LCC values for different confidence levels. Originally reported in the Portland Cement Association Executive Report e-newsletter. Click here to read and download the Research Brief. According to the 3rd quarter Producer Confidence Index, conducted by NRMCA over the last two weeks of September, confidence in current and future economic conditions of ready mixed concrete producers slipped almost 3 points to 68.3. Second quarter findings (see graph below) set a confidence level of 71.2. While producers continue to have modest confidence in current and future economic conditions, expectations seem to be tempered with more pessimism in the 3rd quarter as producers face regional cement allocations, an uncertain regulatory outlook and the coming winter months. Despite these issues, producers remain optimistic about future economic conditions, reporting a future confidence level of 71.3. The survey uses 2006, the best year for ready mixed concrete production and financial performance on record, as a baseline to assume a 100 point positive PCI. The 3rd quarter PCI included 84 member companies, or 14% of NRMCA ready mixed concrete producer members. NRMCA’s PCI survey is conducted each quarter to gauge economic attitudes in the ready mixed concrete industry. For more information on NRMCA’s Producer Confidence Index, contact Michael Olivarri at molivarri@nrmca.org. The Manufacturers, Products & Services (MPS) Division of NRMCA is pleased to announce that applications are now being accepted for the 2015 Concrete Cares Award. In order to recognize the full scope of ready mixed concrete producers’ community service, the MPS Division will hand out two Concrete Cares Awards in 2015 – one for a producer member company producing fewer than 250,000 cyds annually and a second award for a producer member company producing over 250,000 cyds. The Concrete Cares Awards will be presented during the Annual Award Breakfast at NRMCA’s 2015 Annual Convention in Orlando, March 1-3, 2015. With ready mixed concrete plants in almost every community in America, NRMCA member companies are making a real difference. From Earth Day celebrations, to organized volunteering for Boys & Girls Clubs, local schools and recreation departments, to raising awareness for breast cancer screenings, ready mixed producers are at work every day in their communities. The Concrete Cares Award aims to recognize these efforts and shine a national spotlight on the positive impact ready mixed concrete companies have in hometowns across the nation. A donation in the name of the selected honorees will be made to the charity of their choice. Ready mixed concrete producers that are members of NRMCA are eligible for nomination. To view past honorees and submit an application/nomination for consideration, please use the appropriate form found here and forward the nomination form and supporting materials to Kathleen Carr-Smith, senior vice president, membership and communications, via e-mail at kcarrsmith@nrmca.org or mail to 900 Spring Street, Silver Spring, MD, 20910. Nominations must be received by January 5, 2015 for consideration. The preliminary estimate of ready mixed concrete produced in August 2014 is 32 million cubic yards, 3% higher than that in August 2013. The estimated production through August 2014 is 211 million cubic yards, 7% higher than during the same period in 2013. Ready mixed concrete production is estimated from cement shipments reported by the U.S. Geological Survey. Details on ready mixed concrete production are available for NRMCA members here. In honor of long-time NRMCA friend and concrete industry legend Richard Gaynor (1931-2014), NRMCA and industry personnel have formed team "Concrete Cures" to raise money and participate in the Washington, DC, "Walk to End Alzheimer's" this Saturday, October 25. Several of our walkers also have family who have suffered or are suffering now from this disease as well. You can learn more about the walk and support our efforts by visiting the team's Web page. From there, you can visit individual walkers' pages as well. If you are in the Washington, DC, area and would be interested in joining team "Concrete Cures" for the walk in October, you (and family members) would be welcome - please contact NRMCA's Nicole Maher at nmaher@nrmca.org for more information. NRMCA's Annual Short Course scheduled for November 3-7 in Silver Spring, MD is sold out. The next NRMCA Regional Concrete Technology Training and Certification Program (Regional Short Course) is scheduled for February 9-13, 2015 at the DoubleTree Suites by Hilton, Seattle Airport/Southcenter in Seattle. The course is co-sponsored by the Washington Aggregates and Concrete Association. NRMCA is now accepting registrants for the Seattle course. The short course provides a fundamental understanding of concrete, aggregates and concrete making materials; requirements in industry codes and standards and proportioning concrete mixtures. Attendees have the opportunity to obtain industry-recognized NRMCA certifications: NRMCA Level 2 and 3 Concrete Technologist certification and an optional NRMCA Grade II Field Testing Technician certification. These industry certifications are essential for technical service personnel with suppliers of materials to the concrete industry and with concrete producers. Registration for the course will close at a maximum of 50 people due to space restrictions. Interested persons should register early! Click here for more information about the course, registration options and staff contact. This year’s Environmental Certification Course will be held in Phoenix from December 3-5. Course attendees will be educated on industry-specific environmental issues that affect ready mixed concrete production, including the Clean Water Act, the Clean Air Act, Discharge Permits, Stormwater Management, the Resource Conservation and Recovery Act, Solids Management, Hazardous Materials, Dust Control, Recycling, Spill Prevention Plans, Air Quality Management, Noise Management, Environmental Auditing, and much more. Those who should attend include plant managers, environmental managers, compliance managers, executives or anyone with fiscal and/or environmental responsibilities that should know the details concerning your company’s responsibilities when it comes to EPA regulations, the Clean Water Act, Discharge Permits, Stormwater Management and numerous other critical environmental matters. Click here for registration options and more information on contact Gary Mullings at gmullings@nrmca.org. NRMCA announced at Greenbuild 2014 held this week in New Orleans that it has published a comprehensive set of industry average environmental impacts for concrete to help its members address the movement toward product transparency in LEED v4 and the Architecture 2030 Challenge for Products. These NRMCA documents, known as an Industry-Wide (IW) Environmental Product Declaration (EPD) and Benchmark (Industry Average) Report, disclose the environmental impacts of concrete manufacturing for a wide range of concrete products. EPDs are third-party verified reports published by product manufacturers that provide quality assured and comparable information regarding environmental performance of their product. LEED v4 has a credit that encourages a project team to use 20 different products on a project that have EPDs. For concrete, a product is defined by each unique mix supplied on the project which means it usually provides several products for a single project. LEED v4 requires that a company must have provided data and be listed in the EPD. The Benchmark (Industry Average) Report presents the impacts for average concrete mixtures at the national level and in eight different regions of the country. This allows companies to compare their product-specific environmental impacts to industry averages and potentially participate in the second option of the LEED v4 EPD credit, which requires a project team to use products totaling at least 50% by cost of all materials on the project that demonstrate three impacts below industry average. The reports also support the Architecture 2030 Challenge for Products. The benchmark impacts allow manufacturers and specifiers to demonstrate progress toward the 2030 Challenge for Products’ goals of incremental reductions in carbon emissions from 35% below baseline in 2015 to 50% below baseline in 2030. Click here for more information and to register for a free Webinarm or contact Lionel Lemay at LLemay@nrmca.org, 847-918-7101. NRMCA has scheduled a free Webinar designed specifically for NRMCA members who participated in the NRMCA Industry-Wide EPD and Benchmark Report development, although others are welcome. It will discuss the purpose of the EPD and Benchmark Report and how it can be used to demonstrate compliance with LEED v4 and other standards. It presents ideas on how they can be used to position a company as a leader in green building and the transparency movement. For more information, contact Lionel Lemay at LLemay@nrmca.org or 847-918-7101. Media articles on Congress, transportation infrastructure, regulation, taxes and other subjects, each of which relate to the ready mixed concrete industry, are updated each week by NRMCA's Government Affairs staff. To access the most recent compilation of articles for October 13 - 17, please click here. As 2014 winds down, it’s time to assess if your sales reps are performing at the top of their ability...and if they are not, what you can do to help them in 2015. On Wednesday, November 19, a 90-minute Webinar will discuss how to learn to identify the specific "barriers" that may be holding back your sales reps and how to create a personal coaching and motivation strategy to improve performance. • How to conduct a performance review that generates positive results. Click here to register, for more information and NRMCA staff contact. The NRMCA October Internet Spotlight, good through Tuesday, November 4, is theConcrete Plant Operators Manual. Jointly prepared by the Concrete Plant Manufacturers Bureau and NRMCA, this manual is a comprehensive guide for the batch plant operator. It includes valuable information on materials, batch tolerance and aggregate moisture, calculations, plant maintenance, safety and more. Order online today and receive 20% off. Regular member price is $28, Internet Special $22.40, plus shipping. Use Discount Code: ISOCT14.